Featuring fresh floral blooms that have been spread gracefully across the edges of the design. A truly minimalist modern design with chic typography. A crisp white background provides the perfect contrast to silhouettes of playful blooms in twelve fresh and vibrant colors. Customize your Bouquet anniversary coasters today! Bouquet anniversary coasters are one of the most memorable ways you can find to commemorate your anniversary. Choose from several shapes—3.9" round, 3.9" square with rounded corners, and others. They are extra-thick, 58-point paper board. To give you an idea of how thick they are, a stack of a dozen coasters is about 3/4" tall. They are made of absorbent pulpboard to help protect your tabletops. The coaster surface is coated with a smooth matte coating to provide beautiful, crisp printing. Each coaster is individually die-cut, so their top has a soft and rounded edge. Our anniversary coasters are designed to be disposable, but they are durable and re-usable. If unused, they can be kept for keepsakes and will keep forever. 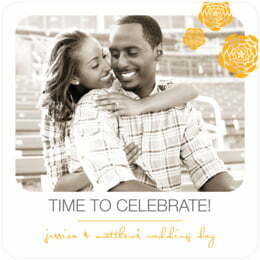 These are working coasters; they are designed to be used for your special event, wedding anniversary, partnership, etc. When spilled on, they will absorb liquids, and it will leave marks on the coasters. Anniversary coasters are printed on one side only, and on the blank back, a small Evermine logo is debossed. Anniversary coasters come beautifully packaged in boxed sets of a dozen. 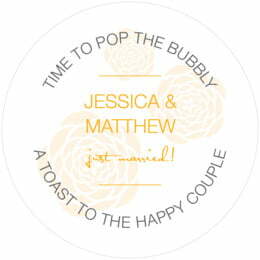 Select the green "Personalize" button to begin customizing your Bouquet anniversary coasters today.